It’s 2052. 7 years since it happened. You find these objects inside an abandoned farmhouse outside of Georgetown, Texas. This is the apocalyptic mission statement of Stuart Wallace’s show Future Artifacts of Sprawl & Sting that sets the stage for his diverse practice. 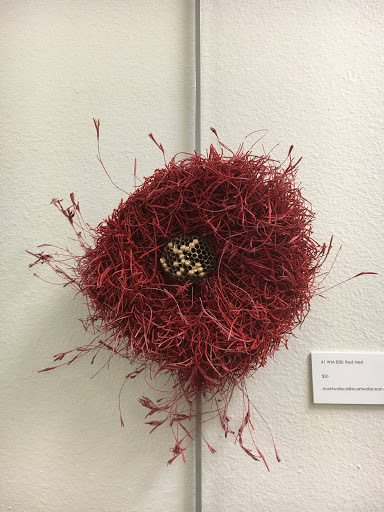 Exhibiting an array of assemblages and photographs that include imagery of natural elements and the female form, Wallace’s body of work centers around the idea of the lost and the found with a nod to science fiction. Encountering this futuristic unknown world, the artist has become a makeshift archaeologist and devised a categorization system for each art object. The categorization includes, among other things, the number indicating the sequence in which artifacts were discovered and the title of the work. Underneath is the first work one encounters in the show, and it is striking in its minimalistic approach and materiality. 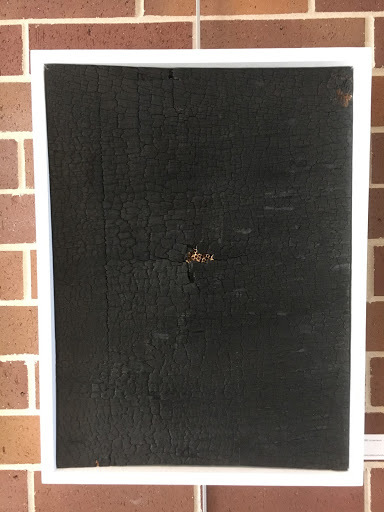 The work consists of black, charred wood encased in a white frame. 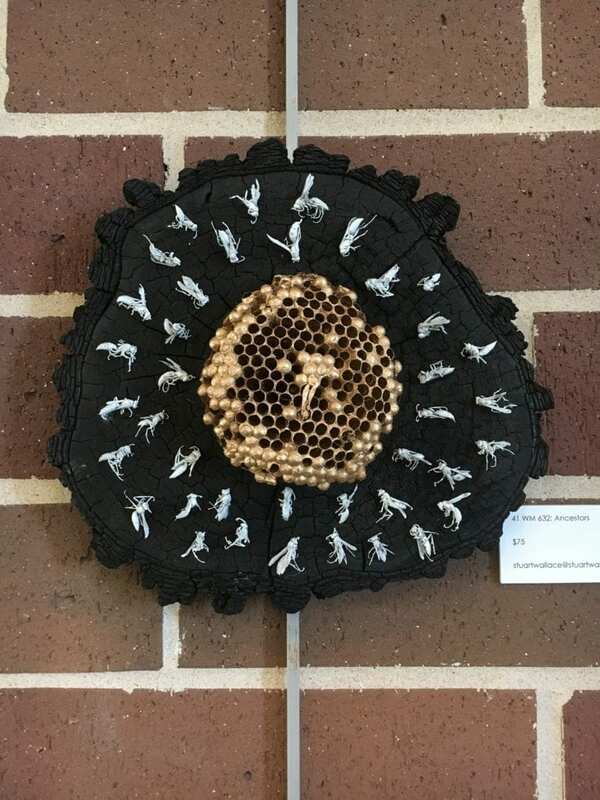 Appearing almost reptilian with its scale-like surface, the center of the work has a gold wasp’s nest erupting through it. Underneath is beautifully unsettling and leaves the viewer on guard as if at any moment a swarm of wasps will come careening out to engulf you. Wasps and their nests are a significant motif in Wallace’s narrative. They are given almost mythical status particularly noted in his gilding of the insect and their abode. The artist employs actual specimens delivering an equally delicate but morbid touch. In Ancestors, white wasps encircle a gold shard of nest in which the queen, presumably, sits in one of the combs all atop a scorched piece of wood. Resembling a mandala in shape, the insects seem to be taking on attributes of this spiritual symbol as they guard their queen. Discovering this piece in the abandoned farmhouse, it leads me to imagine it as a shrine to one’s most revered and beloved figure – the queen wasp. Fire and its destructive capabilities are particularly influential in Wallace’s artwork. Using a flamethrower, he is torching the surfaces of works to the point of oblivion. The use of this technique reminded me of the work of Alberto Burri in his Combustioni series who uses the element as a material to consume and obstruct a painting’s surface. Fire is a tool of radical transformation in both artists’ hands that takes on monolithic meaning and importance. Wallace has masterfully set the stage to tell his tale of a fictionalized dystopian culture. He has woven together disparate ideas through his finely executed works of art. By giving the audience crumbs to follow, Wallace is allowing the viewer to construct their own winding plot and narrate their own story for what occurred in 2045.